In the last entry I mentioned that we didn't have a campground reservation on either side of the Teton Range for the rest of this week. That was risky but it worked out OK this time. 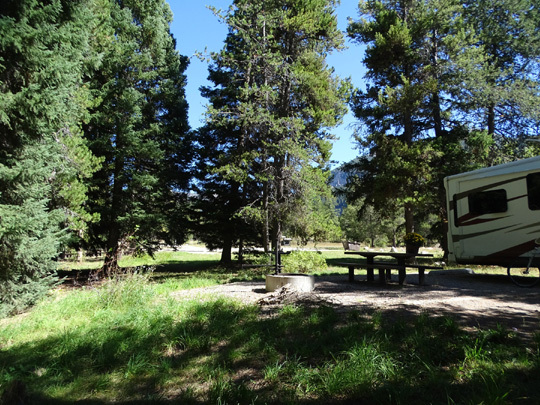 When we got to Driggs, ID on the west side of the mountains we checked out the Reunion Flat National Forest Service campground across the state line in Wyoming. We've stayed there previously and wanted to see if any suitable sites were available -- yes, so we're here for a few days. Jim relaxes in our shady "front yard." This is our sixth time at Reunion Flat -- 2007, 2009, 2010, and 2011 for the Grand Teton ultra-distance trail runs, 2013 because I love to hike and Jim likes to ride his bike around here, and now. We've occupied the same el primo site, shown above, every time. 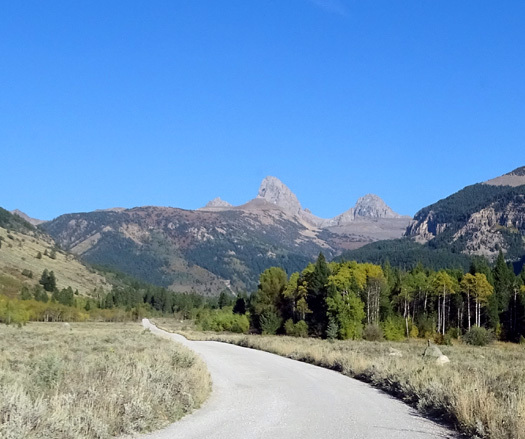 There are several great trails to hike in the nearby Jedediah Smith Wilderness on the west side of the Tetons. 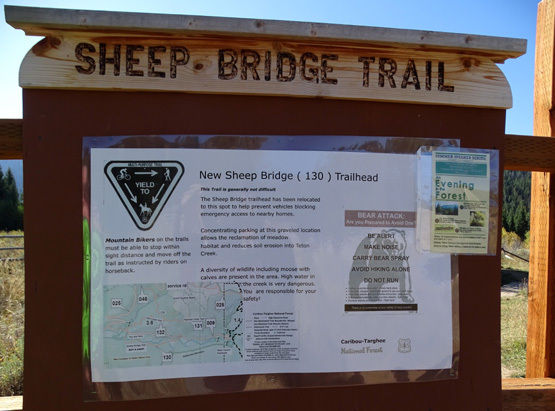 Dogs and horses are allowed on them; they aren't allowed on trails on the other (national park) side of the mountains. There are also some nice trails in the nearby Grand Targhee ski area, although they are also open to mountain bikers and I don't like that so much. We were surprised to see so many vehicles with bike racks at the trailhead a mile into the canyon road this morning. There are probably more bikes on the nearby non-wilderness trails than hikers, runners, or equestrians today. 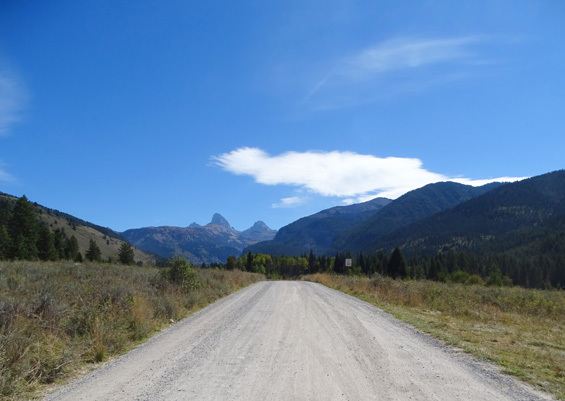 Above and below: "back side" (view from west) of Teton peaks from Teton Canyon Rd. Jim tried to find out online if our favorite site at Reunion Flat was reserved any days from now till Sunday. We could reserve only on Sunday online, and it said the other days were "walk in only." Jim couldn't tell for sure if the site was reserved before that and possibly occupied now. We decided to check it out and if we couldn't get that or another suitable site, we'd continue on to Grand Teton National Park on the east side today and try our luck there. 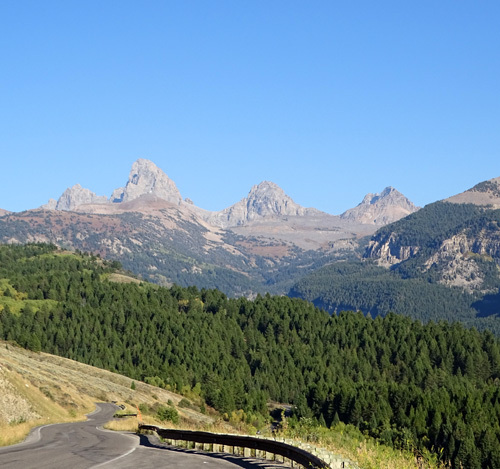 Another view of three prominent Teton peaks from Teton Canyon Rd. Jim parked the camper along the street in Driggs that becomes Ski Hill Rd. and we drove the car about eight miles to the campground. No one was camped in any of the four individual sites or the three group areas and our favorite site had an "open" sign on it. Yes!! The CG host was gone. We put our name and date on the post at the site we wanted and left a note on the host's door, letting him know we wanted the site for five days. We drove back into town to get the truck and Cameo, then back to the campground. Jim wanted to check e-mail while he was in town so I left first and sat at our new site for a few minutes until he got there. By the time Jim passed this spot a few minutes later the bear was gone. 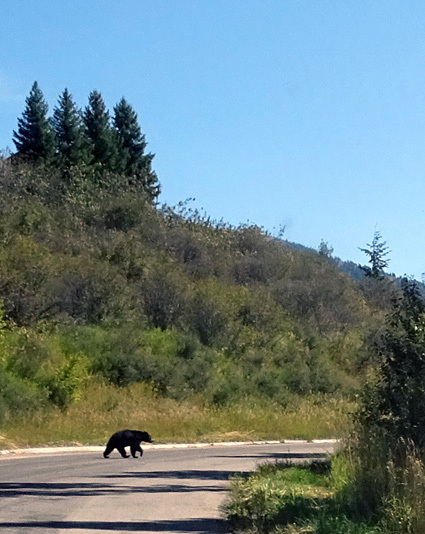 We've seen only one bear here before and it was on the Teton Canyon Trail several years ago. Jim spotted it first, across a creek. There was also a bear at the end of that trail one of the first years we were here. Another hiker coming from that direction warned me. Cody was aware of it (hair up, nose frantically smelling the air) but I didn't see it. so they do move. I don't think it's nice to honk the horn. 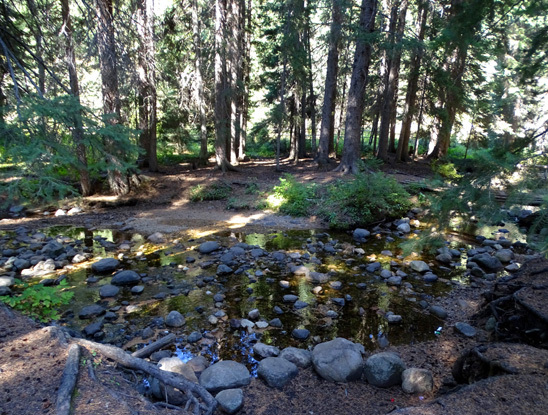 When Jim got to the campground with the Cameo he filled the tank with fresh water, then backed into the site. It's an easy one to get into, which is one of many reasons we like it so much. After we got set up we ate lunch and relaxed. The CG host came back after lunch and said we could have the site as long as we want! We lucked out. 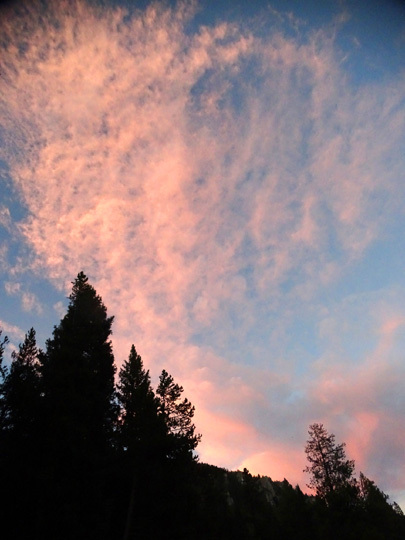 The campground will probably be open until the end of the month because it's still so warm. This is Chris' first time hosting here and he loves it. I think there has been a different host each time we've been there. Jim asked if there's a wedding this weekend. No, but there have been three already this summer and another is scheduled on the 18th. No events are booked while we're here. That's good news, too. There was a wedding when we were here two years ago. It was interesting but there were an awful lot of people, noise, and loose dogs and children running around that weekend when two young National Forest Service workers got married. 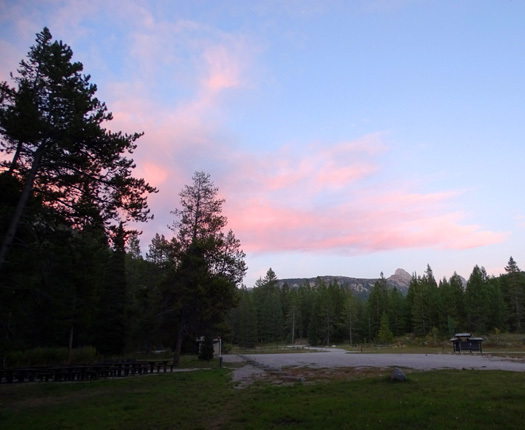 We just love this campsite. 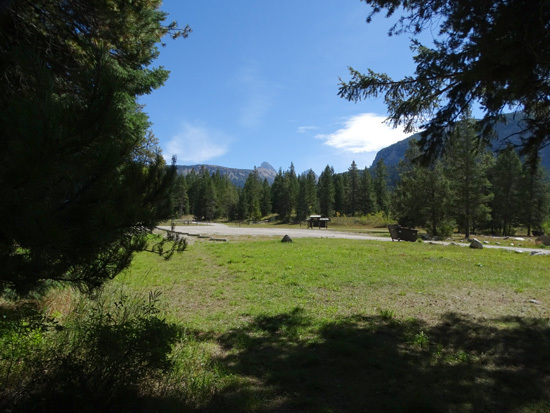 There's a great view of Table Mountain, the peak of Grand Teton -- the one that looks like a shark fin -- and South Teton's peak from our bay window, and we can see people coming and going from the campground. Zoomed in on the Teton peaks; flat-topped Table Mountain is marked with an arrow. There are no hookups in this campground. The sun is on the off-door side and front cap, so the door side is mostly shaded. Although we're surrounded by tall pines and spruce trees we get enough sun on the solar panels to keep the batteries powered most of the day (we had glorious sunshine every day we were here). There are no restrictive generator hours, just quiet hours from 10 PM to 6 AM. We can use one of the nearby bathrooms if we need to, and if we run out of water Jim can easily get more by running two hoses across the road to a threaded spigot. The cost is still $6/night with our senior National Park Service passes ($12 regular rate with no pass). Jim paid the CG host $30 for five nights. 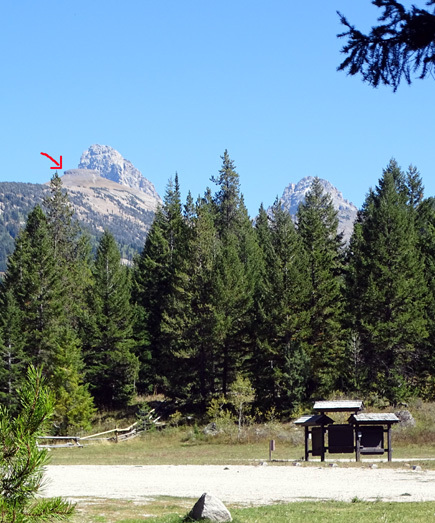 We'll go over to the east side of the Tetons on Monday, hoping there are more sites at Gros Ventre Campground then. In the middle of the afternoon an older couple came in with a tiny camper and parked across from us. No one else came in to camp while we were here this week. 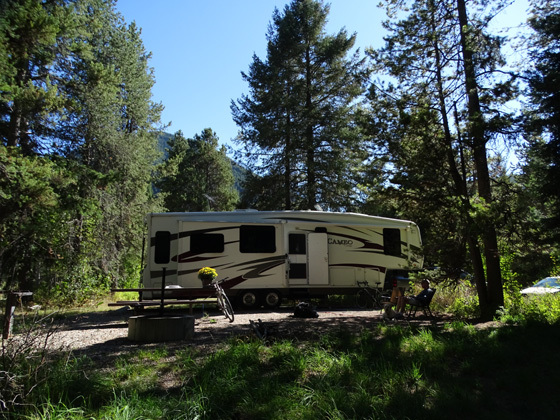 There are only four individual RV or tent sites and three group areas in Reunion Flat. Another Forest Service campground two miles farther at the end of the canyon road has 30+ sites. It's nice but most of the sites at that campground are too small for our rig and there are always more people there. Folks with kids would like that campground but we much prefer Reunion Flat. Each day Jim played ball with Casey and rode her with the bike several miles in the campground or in Driggs. He went into town each day to get online since we don't have a signal at the campground. 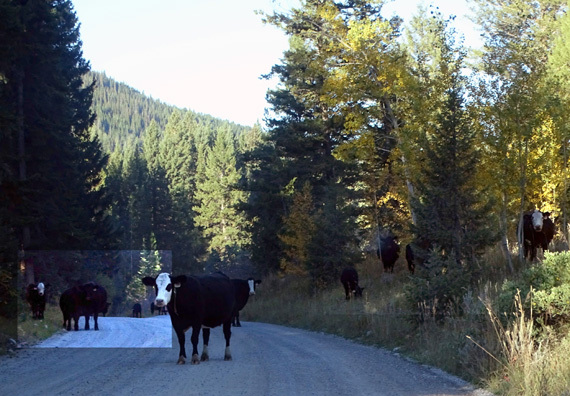 He doesn't like to ride with her on Teton Canyon Rd. because some inconsiderate people drive too fast and raise a lot of dust on the dirt road. 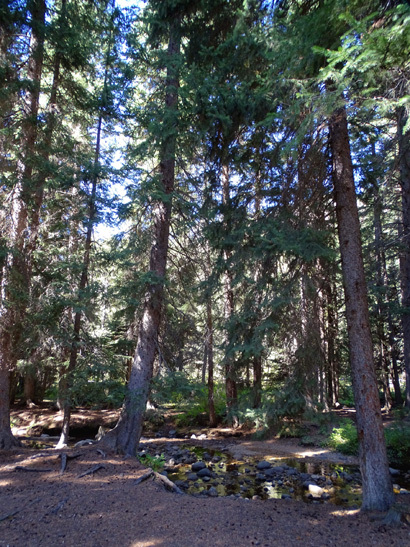 I also took the dogs on walks by the little creek next to our site (next two pictures) and down to South Teton Creek on the other side of the campground. There wasn't time to hike on the trails up at the ski area this visit. 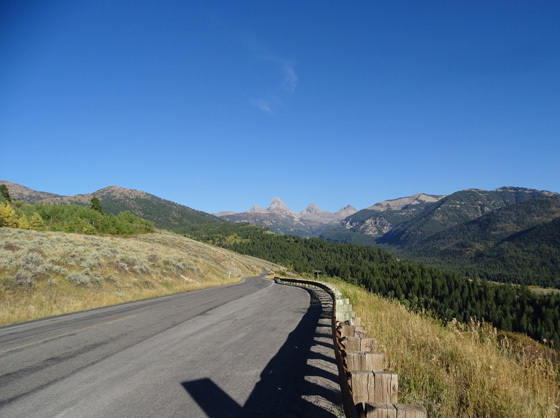 On Friday we drove up to the Grand Targhee Ski Resort at the top end of Ski Hill Road. 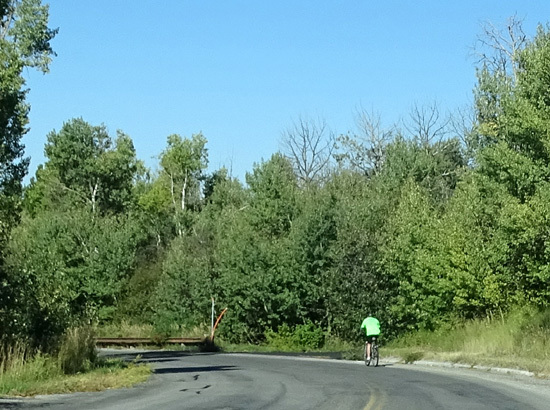 Jim got out and rode his bike about twelve miles down the paved road to Driggs. No bear this time. Jim was disappointed he didn't get to see it. Jim continued riding down to Driggs to the grocery parking lot where I parked the car. 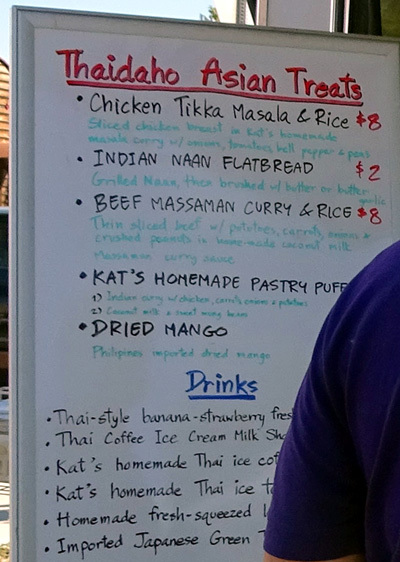 We ate lunch and bought some produce and baked goods at a very nice farmers' market near the grocery. 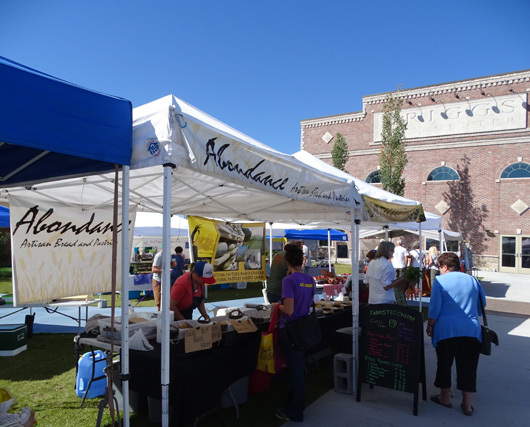 We were pleased to find a larger percentage of unusual, high-quality food items and arts/crafts than some farmers' markets we've attended in much larger towns and cities around the country. Jim got a big hamburger at another booth. Afterwards Jim rode back to Reunion Flat for a total of 20 miles (plus another couple miles in the campground with Casey). I meant to hike it but never did get 'round to it . . . 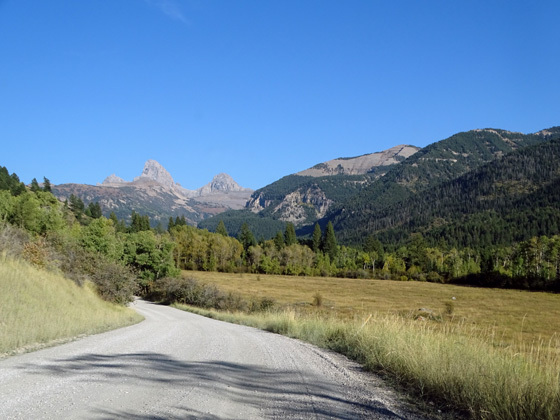 I'll have separate entries re: my very long hike on Thursday in the Jedediah Smith Wilderness (west side of the Tetons) and a day trip over to the national park on Saturday.